You remember in elementary school, how when you liked someone, you gave a note to your best friend, to give to the person you liked, to ask them if they liked you too, and maybe they might want to go steady with you, and if so… check this box? Yeah, that’s kind of how this worked. Only the note was a sign. And the friend was a dog. And going steady meant forever. And the box… well, it held something much prettier than a check mark. 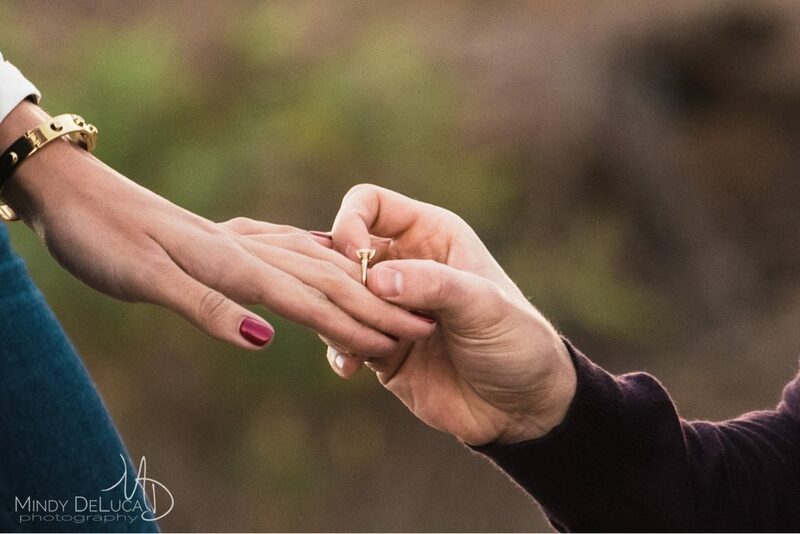 When Chris told me he wanted to surprise his girlfriend with a proposal, and have it photographed… I squealed a little. And then when he told me that he wanted to include his dog, Larry, and that his first proposal attempt had been foiled, and Chelse was now ‘on guard’, and he wanted help with the planning of this one… I jumped up and down. By the time we agreed upon the plan: Chris would “win” a fake gift certificate for a Holiday family photo session as a ploy to fool Chelse into believing that this was nothing to be suspicious of, and that Larry would have a “Merry Christmas” sign that we would sneakily swap out for the identical “Will you Marry My Dad” one… I was down-right giddy. Yes, sometimes the ‘girly-girl’ comes out of me. I can’t help it, I’m a sucker for romance. Because, let’s be honest. Every girl wants their wedding proposal to be a surprise. And they want their man to put thought into it. And what girl wouldn’t want it to be captured so that they can look back on how it happened, and relive those moments, and show their children, many years after they’re married? We met at a secluded desert location near the Superstition Mountains, so that the whole plan could unfold in privacy and surrounded by beauty. And when they stepped out of the car, dressed in the finest polyester Christmas suit and dress you ever did see, I couldn’t stop laughing with joy. Because I knew that within the hour, their crazy family Christmas card photo session would turn into something much more magical. It would no longer be photos as girlfriend/boyfriend/dog, but as an engaged couple and their fur-kid, and soon to be family of three. Sounds like you had a great time… and you made some great photos, too!!! Thank you Ronald! Yes, it was so much fun! 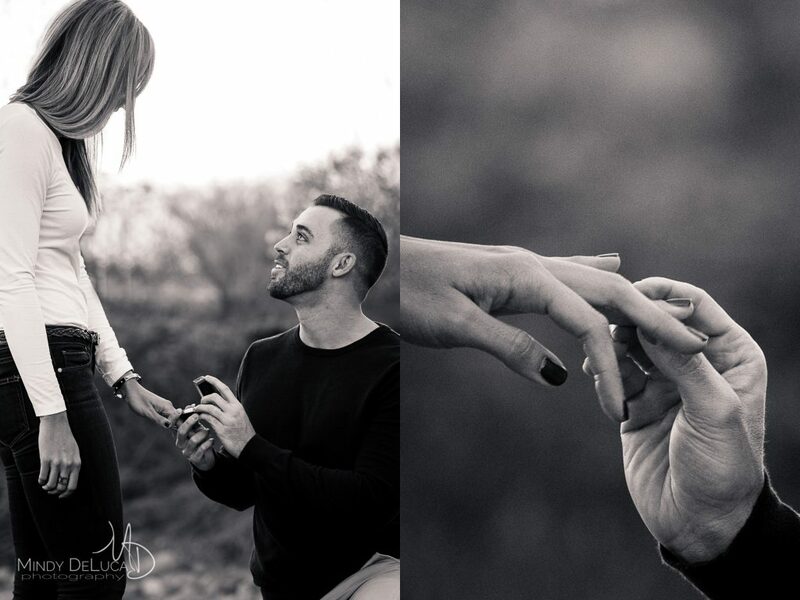 This is such a sweet proposal in Phoenix! I can’t wait to see what you do as their wedding photographer! I love this proposal story!!! 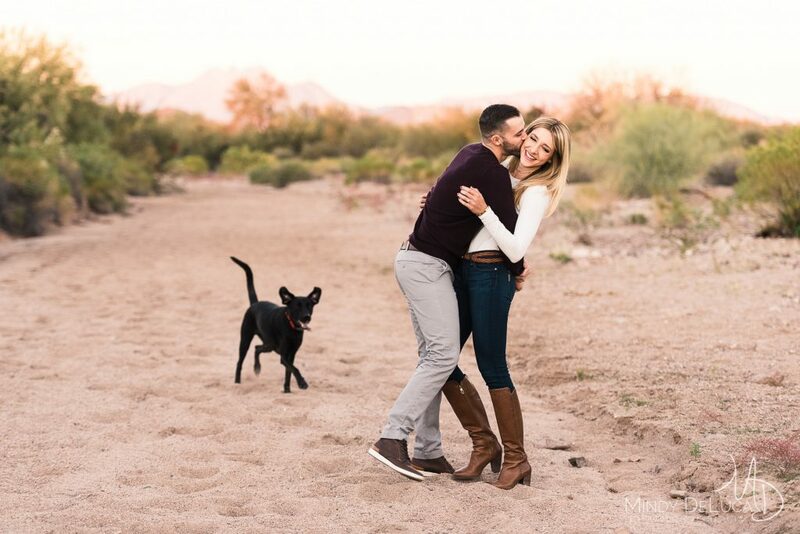 You are such an amazing wedding photographer in Phoenix- they are lucky to have you! 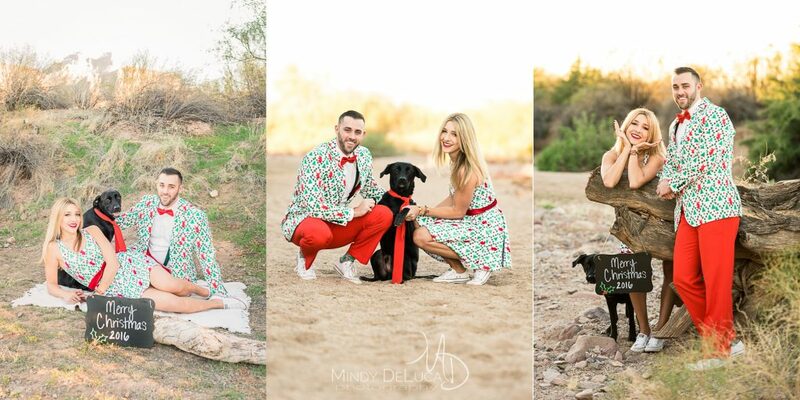 How sweet are these photos and how awesome are those holiday outfits? Haha. 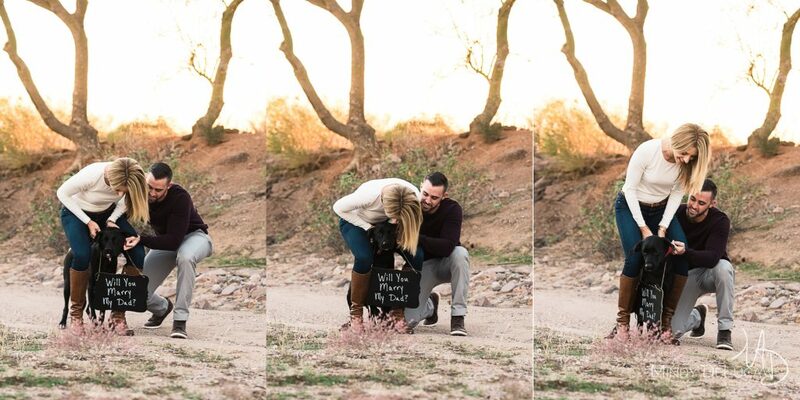 I love that he proposed via the puppy – too cute – that would have melted my heart. You captured everything so beautifully. They are lucky to have found such a talented wedding photographer in Phoenix to make their memories special. Thank you Heather, it was such an awesome gesture on his part, and I was so incredibly honored to have been a part of it! Oh these guys seem so fun! What a fun idea! I have a friend in the Phoenix area looking for a wedding photographer! Contacting you now! Oh, thank you Jamie! I would love to help them! My friend is looking for a Wedding Photographer in Phoenix!! I will send them this link right now! I’ve always wanted to do this for my GF. How do I book something like this? IN addition to the Engagement Photo session, I’d most likely be wanting to hire you to photography our wedding in Phoenix. I would love help you! Feel free to fill out my contact form here: https://www.mindydeluca.com/contact/ and I will be in touch! LOVE these images!!! 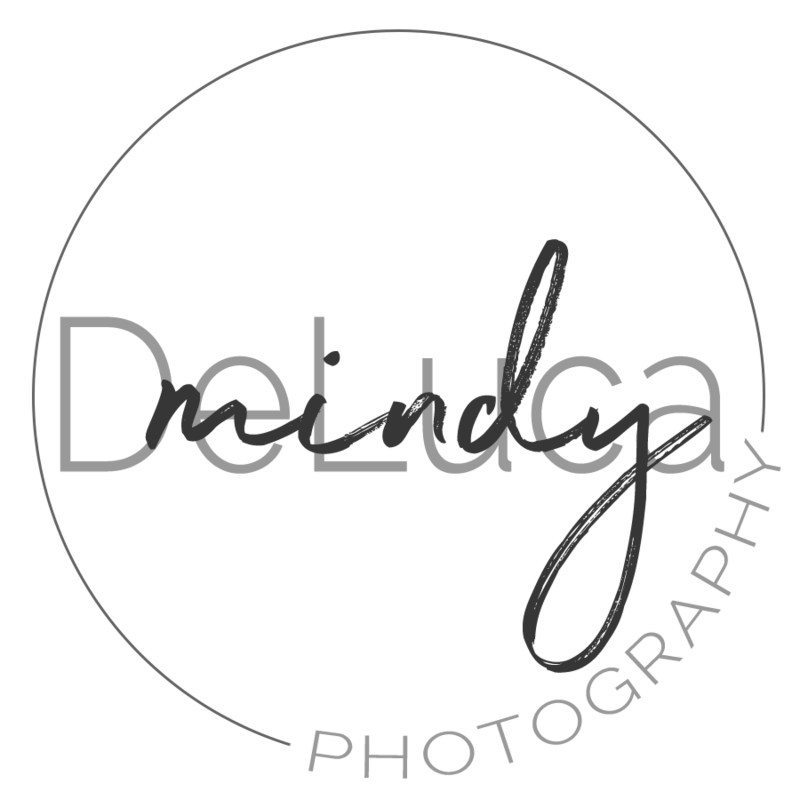 I have been looking for a wedding photographer in Phoenix. Emailing you now! I am helping my cousin research a Phoenix Wedding Photographer and am so happy to have found your work!! Wow these are gorgeous! 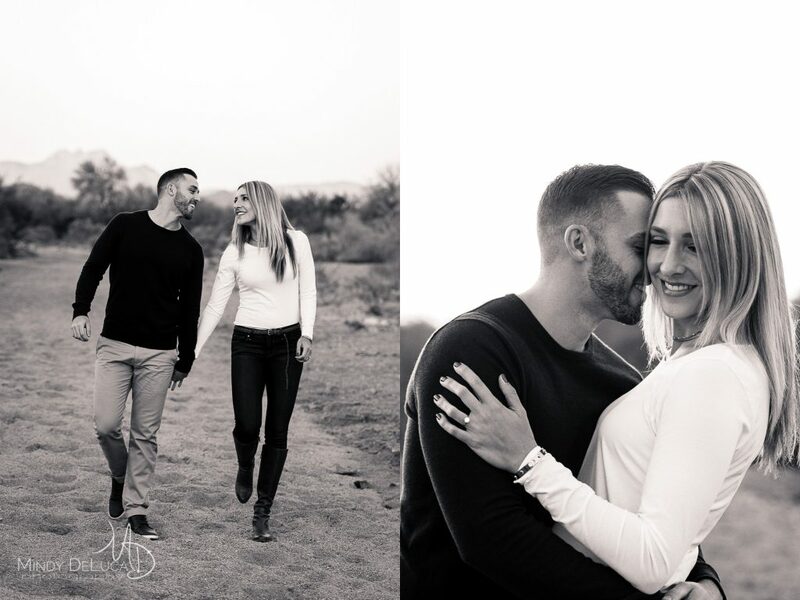 Phoenix makes a beautiful backdrop for engagement photos! this is the best story ever! Will there wedding be in Phoenix AZ, please tell me you will be their wedding photographer!?! I bet their wedding will be crazy fun!